Guess what?! Four Tines and a Napkin is officially three years old today. I can hardly believe that all of my eating/cooking/food adventures have been thoroughly documented in that long of a span! Four Tines has come a long way since then -- photography and resulting skills slightly different (hope you're liking the more condensed, viewer-friendly grid format); dining experiences running the gamut; plus, a new header/logo -- and I hope it can only move on up from here (fingers crossed!). I realize I have been more absent now than I have been during the first two years of Four Tines' life, but counting beans has demanded more of me than it ever has, and I've somehow found a happy balance between that and marauding for morsels. Thank you for being patient with this change of direction -- it really means so much that so many of you have maintained your readership loyalty after all of this time. This past year, I have been focusing on not just my current city (NYC, baby!) but branching out to include a more meticulous rundown of my travels this year, including Charleston (a WAY overdue post is in the works, I promise! ), Washington D.C., Chicago, Maine, Philadelphia (coming soon! ), St. Louis (also coming soon) and a couple other places I'll be visiting in the next few weeks. I've realized that it's something that I find myself to be quite good at -- that is, creating dynamic travel itineraries filled with great food and drink along with other noteworthy sights and sounds. It is with these Wanderlust posts that I summarize the highlights of things I did in a particular area/city that I hope to share with my friends, family, and readers so that they'd have the best experience in another city as I did, knowing what they NEED to see/do/eat and what they should most likely bypass. 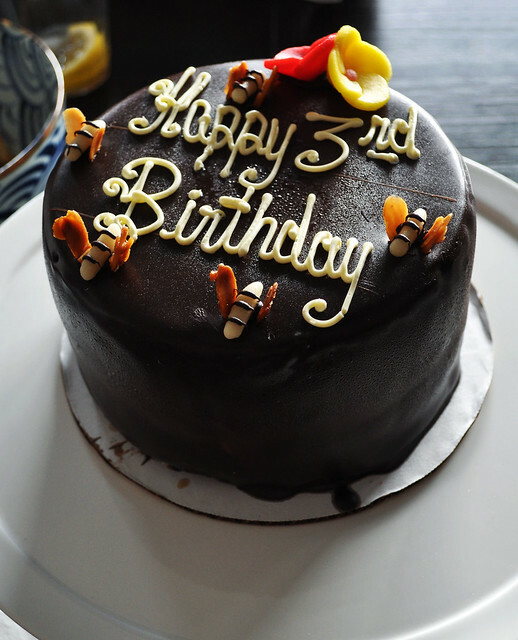 With all that being said, I celebrated this three-year evolution of Four Tines and a Napkin with a few nearest and dearest to me with a Busy Bee cake from Black Hound New York, which is incidentally one of the bakery's best sellers and signature cakes. 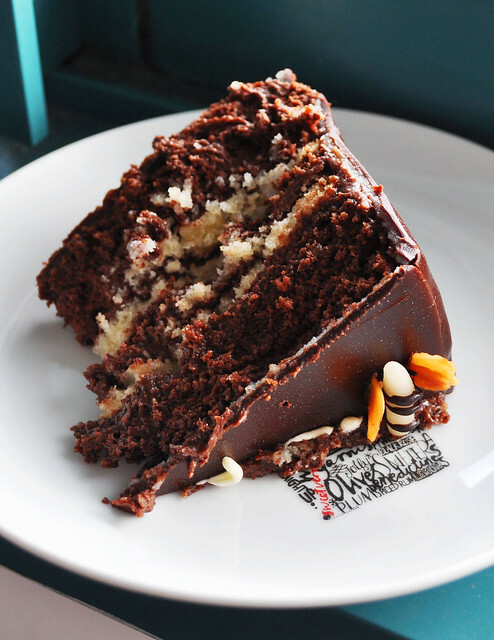 It is comprised of three layers of chocolate butter cake, two layers of almond butter cake, two layers of bittersweet chocolate mousse, and one layer of marzipan -- all covered in marzipan and bittersweet chocolate and decorated with marzipan-and-almond petal bees. Yup, it was even better than it sounded and looked -- no wonder it's one of the bakery's bestsellers. And it wouldn't be the proper blog birthday celebration without sparklers! 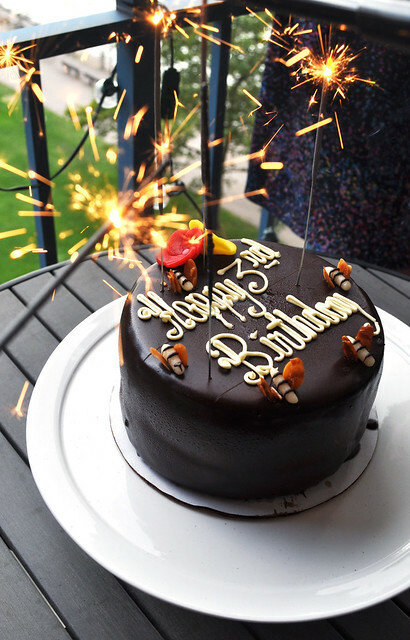 Price point: $31 for a six-inch Busy Bee cake from Black Hound New York, $45 for 288 ten-inch sparklers from Sparkle.